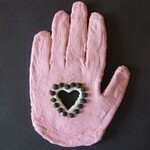 This mothers day crafts section consists of all those ideas, which could not be fit into any other categories. Anyway, they're at least as nice as the other mothers day crafts, the flowers for example! 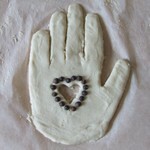 These arts and crafts ideas can be great mothers day activities as well. So take a look at the ideas below! 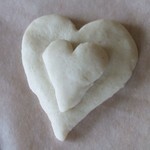 Before you actually start creating this mothers day crafts idea, you'll need to make the salt dough. It's very simple. Mix 1 cup of salt with 2 cups of flour, and then add 1 cup of water. 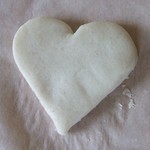 If the salt dough is too sticky, add more flour, and if it's to dry, add some more water. 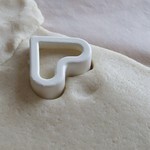 Next, get your rolling-pin and pastry-board, and roll out the salt dough. Now, you're ready to start. Step 1. 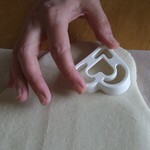 Get your heart-shaped pastry cutter and cut out the heart shape from the salt dough. Step 2. 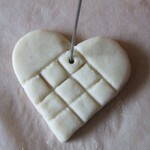 Now, you'll need you thin stick to make the squared pattern. 'Scrape' the lines first as shown. Step 3. Now, place the stick all the way over each lines to make nice and even. Step 4. Using the same stick, pierce a hole in the middle of the top square as shown. Step 5. Place your heart on a heater until it has dried out completely (it takes usually 1-2 days). Step 6. 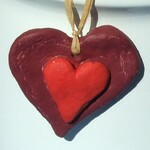 Paint the salt dough heart using the acrylic paints. The red and white are only tips: you don't have to use the same colours. Step 7. 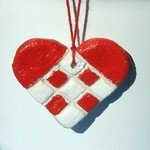 Finally, string the red thread through the middle hole and make a knot on top of it, so that you can hang up the finished heart somewhere. Step 1. 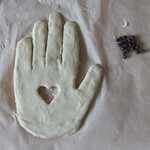 Once you've made the rolled out salt dough, place your hand on it and using the stick, cut out the shape of your hand. 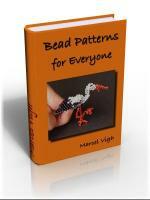 Make the contour lines between your fingers. Step 2. 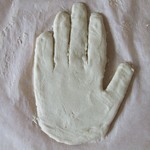 Before you continue, make the hand nice and even, simply using your fingers. 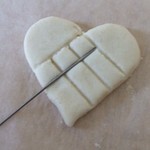 Next, get your pastry cutter, and cut a heart in the middle of the hand as shown. Step 3. When your hand is nice and even, and there is no rough spot at all, then you can decorate hand with the seeds. Just push the seeds around the heart in the middle. Step 4. Here is your almost finished hand. Place it on a heater for about 1-2 days, until it becomes completely dry. Step 5. The final step is the painting. 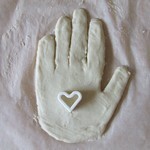 Get your acrylic paint and brush and paint the hand. Finally, allow it to dry. Step 1. 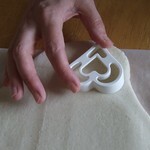 Make the salt dough as explained above, and cut out the big heart using the pastry-cutter. Step 2. 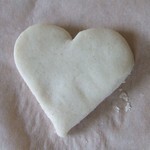 Here is the bigger heart, on which you'll place the smaller one. You'll make that in the next step. Step 3. 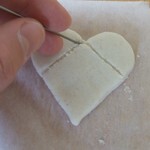 Now, cut out another heart, but this time, use the smaller special heart-shaped pastry-cutter. Step 4. 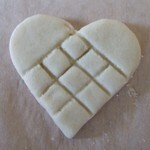 Place the small heart on the middle of the other. Also, pierce a hole on the top of the big heart using the stick. Step 5. Paint the hearts using the acrylic paints. Finally, string the thread in the hole so that you can hang it up later on. Step by step and VIDEO instructions for an origami rose and tulip, egg-box daffodil, salt dough sunflower and tulip, pipe cleaner flower and bead tulip. Instructions for cards decorated with origami or pressed flower.